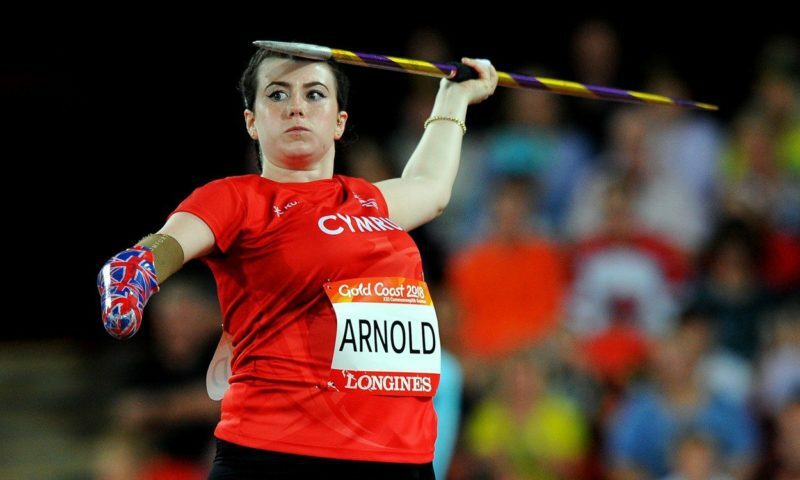 Hollie Arnold responded in fantastic fashion to her world record being broken at the Gold Coast Commonwealth Games on Monday evening, launching the javelin even further with her final throw to win the F46 title. New Zealand’s Holly Robinson had ensured the competition got off to a thrilling start, throwing 43.32m in the first round to beat the world record mark of 43.02m which Arnold had recorded to win gold at the World Para Athletics Championships in London last summer. Arnold was confident in her ability to respond, however, and she did so with her final attempt. Visibly delighted with her effort, the scoreboard showed 44.43m and a short while later the Welsh athlete was confirmed as the champion, with Robinson settling for silver as she did in the UK capital nine months ago. “I feel absolutely amazing,” said the 23-year-old, who was born without a right hand and forearm and also won Paralympic gold in Rio as well as world titles in 2013 and 2015. “That last throw, I just gave it my absolute all. I knew there was a big one there, I just couldn’t get the connection right and that’s key for javelin. I just went out there and threw my absolute all and got the world record and Commonwealth Games gold. All bar one of Arnold’s throws were over 40 metres, while Robinson surpassed that mark with all six of her throws, also improving her pre-competition best with 42.61m in the fifth round. “It was a really emotional competition, breaking the world record and my personal best in that first round. I had to calm down from that and focus on the next rounds,” said Robinson. “I went into the first round thinking that I want to get a solid throw in to start the competition and it ended up being this whopping throw! History was also made by the bronze medal winner, as Friana Kwevira claimed Vanuatu’s first ever Commonwealth medal at any level after a throw of 24.54m.